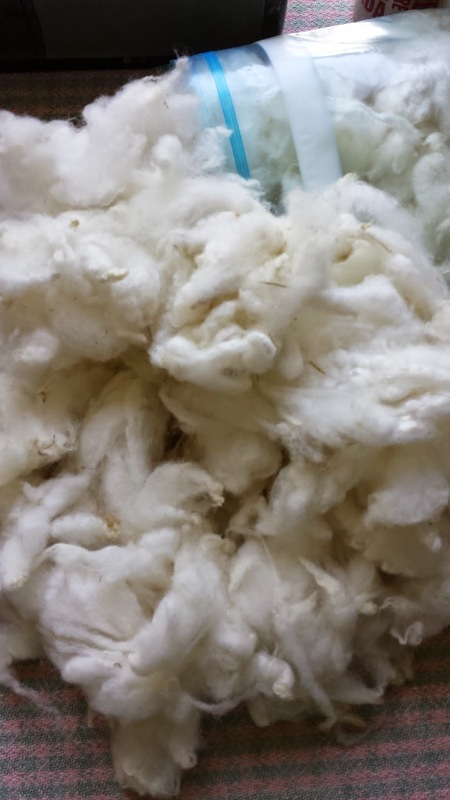 It’s been a while since I wrote a post about locally sourced fibres. Since this blog is called 100-mile wear, I thought it high time I remedied that. I dug through my dwindling unprocessed fibre stash and found a modest bag of locally sourced Cormo – about 12 ounces. Strikingly white with fat, bouncy locks 3 – 4 inch locks, it was just the thing to have some fun with. It had been washed, but that was ages ago. The fibre felt dry, like it had had all the moisture sucked out of it, and it felt sticky at the base. I tossed the entire bag full into the kitchen sink that was filled with hot tap water and a quirt of shampoo. I covered the sink with a Rubbermaid lid and let it sit for about half an hour. Then I carefully lifted it out of the soap water, drained the sink and filled it again with hot water and a quirt of vinegar. Covered it again and then after half an hour, drained the sink. 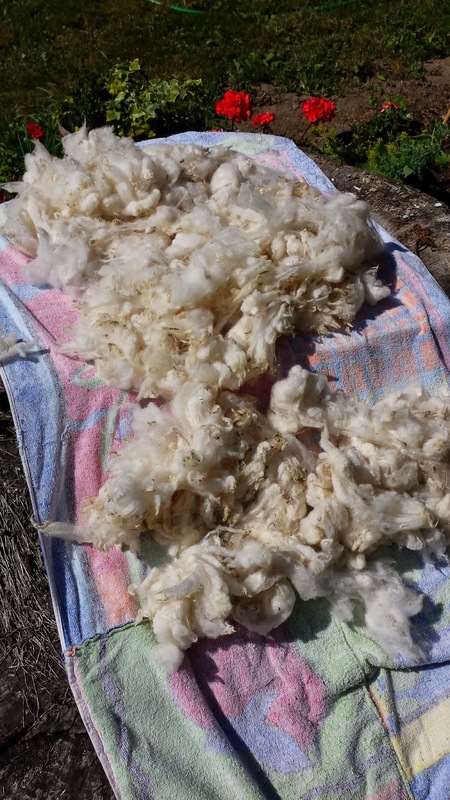 I towel dried the fibre and then put it outside in the bright sunshine with just a wee bit of a breeze. By the end of the day it was dry. A few days later I sampled a few locks with my wool combs. I did this all on the back porch and when I did the first batch, it was in full sunshine. The first batch, in full-on sunshine, combed up beautifully and came off the combs like a dream. It was too hot so I abandoned the activity until later. It was much cooler when I returned to it hours later, and the next two samples were sticky and I could barely pull the fibre off the comb. And it caused a lot of waste. This wouldn’t do. I figured that the problem was some kind of wax or oxidized lanolin in the fibre. It hadn’t been thoroughly scoured the first time and then after sitting for several (yes several) years, it oxidized and hardened. The heat of the sun warmed it up and melted it a bit. But I wasn’t prepared to get heat stroke just to process this fibre. Believing that I needed to soften up the wax and oxidized lanolin, I tossed the entire fleece into a bucket of warm water. Covered it with a tea towel and let it sit for nine days outside. Why nine days? Because I am on holiday and that’s when I figured I needed to deal with it before I returned to work. I am glad that I did deal with it that day because it was starting to smell. Not quite as bad as my retting flax last summer, but decidedly disturbing. Fortunately the smell was just in the water and didn’t affect the fibre. I divided it into three large pots, filled each one with hot tap water and about a 1/4 cup of shampoo. The water felt really soapy. Then I put the pots on the stove to come to a boil. Once they reached boil I let them simmer for about 15 minutes, turning them from time to time to avoid hot spots. To rinse them I filled the kitchen sink half-way with hot tap water and the rest with boiling water. I lowered the soapy fibre into it and gently pushed it further into the water with the insert for my pasta pot. You know, the thing that is almost as large as the pasta pot but has holes like a colander. That allowed me to push the soapy and buoyant fibre into the rinse water without having to manhandle it too much. I let it soak for about ten minutes. Drained the water and filled the neighbouring sink with hot tap and boiling water. This time I added a 1/4 cup of vinegar. Did the same thing with the pasta pot to get it all submerged. After ten minutes I drained the sink and filled it again with hot tap and boiling water. This time I only put a small squirt of vinegar into the water. After ten minutes I drained it completely, put it into the pasta colander and put that into a bucket. Let that drain for about 15 minutes and then put it outside to dry. It was early in the day when I did this so had a good chunk of time for it to dry. Because I didn’t squeeze the water out of it, it took a while. I checked it regularly and flipped it every time I went past it. I covered it overnight and by mid-morning on the following day it was dry. And it is beautiful. Not a spot of wax or any stickiness at all. I did a sample with the wool combs, in the house out of the heat, and it combed up beautifully. So what did the trick? The nine days of soaking? Using a decent amount of shampoo? Using super hot /nearly boiling water for every step of the way? I could have done experiments with the different methods and I’d be able to tell you. But alas, I just wanted clean fibre so I threw every strategy at it. 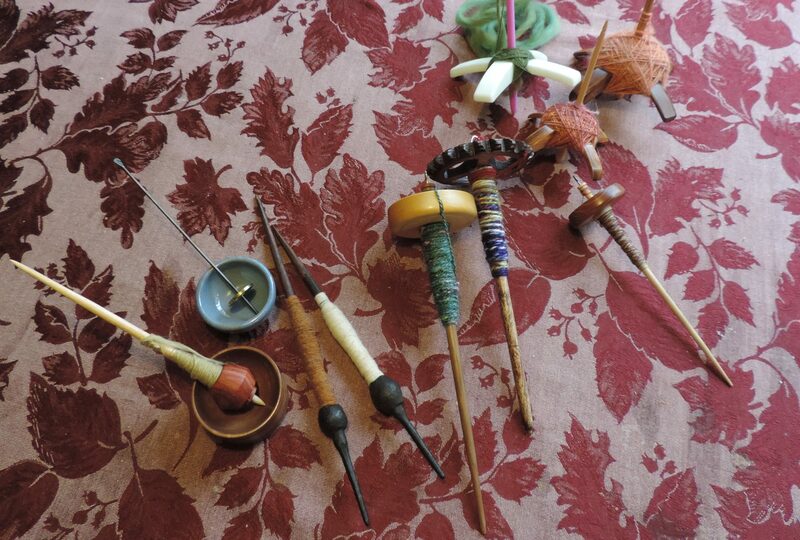 This entry was posted in 100-mile fibre, cormo, scouring wool on August 8, 2014 by DianaTwiss.